The cycle of oppression: A psycho-socio-cultural formulation (DRAFT 1). A common critique of mainstream psychotherapy models is that they take little account of social and cultural forces and of their effect upon psychological structures and relational processes. This is a significant limitation in terms of culture competence. Many minority and marginalised groups continue to see mainstream therapy and mental health services as irrelevant. More concerning is that some may come to experience the therapeutic process as one which exposes and weakens them into powerlessness and; which renders invisible the power of the social context and its related wounds and traumas. It is not unusual for therapists and other helping professionals to feel overwhelmed and helpless in relation to the idea of actively working with social and cultural forces within the therapeutic encounter. However, any genuinely emancipatory and culturally competent approach to therapy must strive to make visible the impact of oppression and help support service users’ efforts to free themselves from its destructive power relations. Relations that exist structurally, socially and psychologically for people who continue to be othered, marginalised and oppressed. More culturally and socially informed formulations may therefore offer tools to validate marginalised groups’ experience of the world and thus contribute to change. Although extremely useful, I have personally been frustrated by purely social formulations which have not commonly highlighted deriving psychological correlates and thus have located themselves within a level of analysis and intervention which may arguably be outside the remit of mainstream psychotherapeutic practice. This post is an attempt at bridging the gap. It provides an introduction to a preliminary psycho-socio-cultural formulation framework (figure A), its rationale and some possible questions to aid reflection. Figure A: Draft diagrammatical formulation of the cycle of oppression. Description of the formulation framework: The cycle of oppression. At the centre of the draft formulation is a cycle of oppression. This cycle is made of four interrelated components varying in proximity to the present or to the ‘here and now’. Those components are: discrimination and oppression, inequality/access to material resources, proximal images/discourses and, distal and intergenerational narratives and events. The oppression cycle is posited to impact on both worldviews and on psychological functioning so that another cycle of psychological correlates is located outside it. The proposed deriving psychological processes are status anxiety and evaluative stress, the internalisation and replication of oppression, the (cognitive) salience of historical traumatic narratives/events and finally the sense of cultural mistrust or paranoia and (affective) distance to the dominant culture. The formulation thus firmly puts the influences of the social and cultural at the centre of psychological functioning. Perception and experiences of oppression such as discrimination and harassment in the workplace (or in other life domains) are commonly reported amongst all members of minority groups. The link between such experiences and chronic stress, poor psychological wellbeing and ill physical health are well established. Perceived and actual discrimination can elicit what has been termed cultural paranoia, a healthy and adaptive response to experiences of oppression. Nonetheless, cultural paranoia can give rise to feelings of hopelessness, helplessness and bias against members of the dominant groups. It can also produce hyper-vigilance and fear. It is thus likely that those who are experiencing it to a high level, will be in some form of distress. From the therapeutic perspective it may be helpful to consider how cultural paranoia may impact on trust and on the working alliance. Mental health services are a microcosm that, it can be argued, represents the social world. A service user who expects that he/she will be discriminated against within services or by therapists and/or that his/her account of such experiences will be dismissed, silenced or pathologized will understandably be guarded and reluctant to disclose relevant difficulties. A degree of hostility may become apparent if the therapist is seen as a representative of the dominant culture, the state and/or authority. How does the Service User (S.U). locate himself/herself, his/her immediate family and distant family culturally and historically? How does the S. U. define oppression and discrimination? To what extent has the S.U. experienced oppression and discrimination? How is sense made of the above? What part do such experiences play/played in current/past psychological distress? What has the S.U. found useful in managing such experiences? What is the S.U. experience of power and powerlessness? Social inequalities have a significant impact on our psychological wellbeing. On a basic level they perpetuate the uneven distribution of protective factors and of stressful life events. Evidence suggests that more unequal societies tend to suffer from poorer mental health. England is one of the most unequal countries in the world. As consumerism is reaching new heights, the gap between the rich and poor is increasing. The relationship between mental health distress and social inequalities is bi-directional so that each has the potential to exacerbate the other. Additionally, although causality and directionality is not always clear, most marginalized groups tend to be socio-economically disadvantaged. The psychological consequences of inequalities are central to the psychological functioning of those who are economically and materially disadvantaged. Wilkinson and Pickett (2009) argue that the impact of income inequality is psychologically mediated by ‘status anxiety’ in that inequality creates social hierarchies which increase status competition, stress and thus poor psychological health. Yet, another psychological mechanism that seems relevant is social-evaluative threat (SET). SET is believed to occur when a central component of our identity is, or could be, negatively evaluated so that we fear rejection. Within such potentially rejecting situations our fundamental need for social acceptance is threatened and a discrepancy between our actual and our ideal self is created giving rise to feelings of worthlessness, reduced relational value and/or shame. How is respect and disrespect framed and conceptualized? To what extent does the S. U. feel pressure to conform to consumerism? Is there a discrepancy between the actual economic situation and the idealized one? Is there access to well established friendships and social support networks? Is there shame and stigma associated with the socio-economic situation? Unsurprisingly a proportion of minoritized individuals will internalize oppression. Internalized oppression can affect relationships within and between minority groups and between minority group members and those who are from the dominant group. This internalisation may manifest in mistrust toward the in-group, idealisation of the dominant culture, distancing from minoritized identities or the holding of stereotypical views about members of the in-group. Further, internalised oppression can, In extreme cases, lead to low self-esteem, self-hatred and even violence towards members of the in-group. Assessing internalised oppression can be difficult because it is associated with high levels of shame and stigma and may therefore not be readily disclosed nonetheless; careful questioning may elicit such processes. Thus, any recurrent negative statements made about the in-group(s) may need further probing as may any negative emotion evoked by questions about the subjugated identity. Various standardised questionnaires exist to assess internalised oppression which may be useful when the therapeutic relationship is firmly established. Acculturation and stages of identity development may also influence the relationship with the dominant group (in addition to the one which may be formed with the therapist) and whether the therapeutic values and norms may be acceptable. What community/group(s) does the S.U. feel most affiliated with? Are there difficulties with fitting-in or with belonging? What is the relationship with members of the in-group(s)/out-group(s) like? Are there weak/strong cultural or other ties with members of other minority identities? Is there a history of immigration or displacement? Is there evidence of shame and stigma associated with the culture of origin? Many theorists have put forward concepts that aim to capture the psychological impact of historical trauma on oppressed groups. For example, Alleyne (2004) has proposed the concept of ‘The internal oppressor’. The internal oppressor is theorized to be a psychic part of the self which can become activated when members of oppressed groups are confronted with oppressive situations in their day to day lives so that painful and emotionally charged historical events gain salience in their awareness. Examples of such painful historical events/processes may include the Holocaust for people of Jewish origin, imperialist processes (eg. slavery, colonisation) for other members of minority ethnic groups or the pathologization of homosexuality for some sexual minorities. In essence, the ’internal oppressor’ triggers a process of interpretation of contemporary oppression in light of historical trauma and injustice. This amplifies the distress experienced. Experiences of oppression can also be reinforced or triggered by public images and media portrayals. Marginalized groups’ representations in the media tend to be distorted. Some groups are particularly prone to misrepresentation e.g. Black males, those who claim benefits, travellers, those with mental health problems and Muslims. A number of studies have identified patterns in media representations of marginalised groups including an overall underrepresentation, an over-emphasis on negative associations (e.g. criminality, unemployment…) whilst at the same time relatively few positive associations. Consequently, public portrayal of minorities tend be one-dimensional, negatively framed or problem focussed. Biased representations leave out significant aspects of minoritized communities’ lives, contributions and experiences. What historical and contemporary narratives has the individual been exposed to? What impact have such narratives have/have had? How are negative images/discourses managed? Has there been exposure to positive role models from the subjugated identity group? Is there shame and stigma associated with negative images/narratives? This post is a first attempt at putting together a formulation framework that is based on a social explanatory model but which also identifies possible deriving psychological processes upon which potential psychological interventions may be based. The framework is not married to any school of psychotherapy. It simply aims to offer a possible starting point to reflect and consider relevant socio-cultural forces, their possible psychological impact and potential interactions. I do not see praxis and social change based epistemologies as incompatible with psychological interventions particularly if they are located within a social model of psychological distress. In fact I believe that both are necessary to facilitate resistance and liberatory efforts. The diagrammatic formulation is based on common themes and theories related to oppression and inequality as well as some relevant empirical findings. Although the framework may be most useful when applied to racialized minorities, it may equally be helpful to support other marginalised groups. I welcome comments and feedback which will allow the improvement and further development of the tool. Alleyne, A. (2004). Black identity and workplace oppression. Counselling and Psychotherapy Research, 4(1), 4 – 8. Dickerson, S. S., Gruenewald, T. L., & Kemeny, M. E. (2004). When the social self is threatened: Shame, physiology, and health. Journal of Personality, 72, 1191–1216. Hutchinson, E. O. (1996). The Assassination of the Black Male Image. New York, New York: Touchstone. Rowlingson, K. (2011). Does income inequality cause health and social problems? York: Joseph Rowntree Foundation. Wilkinson, R. and Pickett, K. (2009). The Spirit Level: Why More Equal Societies Almost Always Do Better. London: Penguin. Wilkinson, R. and Pickett, K. (2010). The Spirit Level: Why Equality Is Better For Everyone. London: Penguin. I attended a diversity meeting a few weeks ago and although this was not the focus; the on-going underrepresentation of Black and minority ethnic trainees (BME) within the profession was briefly touched upon. I was taken aback and quite disturbed when it was posited that the stigma around mental health issues within BME communities was the reason for the difficulties in recruiting a more representative workforce. This proposition was not elaborated upon and went unchallenged. Instead, it seemed to be taken as a given. It felt wrong. I spent much of the remainder of the meeting considering the proposition and trying to access the logical part of my brain but, such was the level of discomfort I experienced, that I was not able to return to a more rational place and put forward some arguments to challenge the proposition. I chose to remain silent. This post is essentially about articulating a reasoned response to the embodied one. Could stigma really be a factor? In all honesty, it was not the first time I had heard stigma put forward as a reason for the lack of diversity within clinical psychology. I have also seen colleagues suggest with much conviction that ‘cultural issues’ were responsible for the lack of Black and Brown faces within the profession. There are various reasons why such notions, which can be stigmatising themselves, may provoke the sort of anxious arousal I experienced within the strategic meeting. It seems those who have put forward the above explanations may not have considered how much of the variance it is suggested, could actually and reasonably be explained by stigma alone, bearing in mind the fact that the acceptance rates for Black and Asian groups are up to thirty times lower than that of White English applicants. Explanations that indirectly put responsibility for inequalities at the feet of disadvantaged groups may act as barriers to curiosity and to more systematic evidence generating. We have such a wide range of sophisticated research methodologies and much research expertise at our disposal, thus, that so many of us seem quite happy to justify stark and enduring inequalities with reasons that lack precision and/or empirical basis, is in my sense both oppressive and defensive. Indeed this stops us from considering, if only hypothetically, the potential presence and influence of less palatable and more anxiety provoking dynamics such as discrimination (both direct and indirect) and bias (both conscious and unconscious). These processes have after all been widely documented within a wide range of environments and activity sectors. Critically, the above explanations further problematize disadvantaged/marginalized groups. BME groups are overrepresented in medicine and within branches of the discipline which specialise in mental health such as psychiatric nursing and psychiatry. They also appear over-represented in mental health social work. If stigma (or ‘cultural issues’) were a key variable for such groups’ difficulties in accessing clinical psychology; contact with which is arguably a lot less stigmatising than the above, surely this would not be expected. The ‘Stigma Shout’ survey carried out by Rethink’s research department a few years ago and which is the largest ever survey of people with direct experience of mental health problems on the issue (n=4000), found no ethnic difference on service users’ reports of mental health stigma and discrimination. Of course that is not to say that there is no mental health stigma and discrimination within BME groups, there clearly is. There is mental health stigma within every ethnic group. Thus, like many others, many individuals from BME communities will sadly have negative feelings about mental health services and in addition may show low levels of service awareness. Many will have limited understanding of the signs and manifestations of mental health distress or see psychological difficulties as character flaws. Some would have been influenced by sensationalistic media portrayal of mental health problems and as a result come to believe fallacious associations between mental health problems and dangerosity. It is also true that wihin some sub-sections magico-spiritual explanatory models will be found. Nonetheless, assuming that stigma may well be a significant factor recruitment wise, it may perhaps be helpful to take our intellectual and reflection efforts further and start being more questioning in this regard, for example, by asking what could we learn from the social context which could be useful in addressing the said inequalities? What practices, at systemic and individual level could perpetuate those inequalities within the profession? How do race, class, and possibly gender oppression (and sexual orientation or trans oppression for some) and the negative stereotypes associated with each subjugated identity, potentially combine and collude with the stigma associated with mental health problems and/or disability? The above are complex questions but questions we may need to grapple with as trainees/clinical psychologists if we are going to effect and sustain any form of genuine change in relation to access to our profession at both training and service level. Psychology and mental health services have for too long been charged with failing to maintain a sense of relevance to marginalised groups’ lived experiences and worldviews, arguably fuelling suspicion, distrust and anger; leading to both poor uptake and disengagement. Not only does this disengagement may increase the likelihood of more adverse and coercive pathways into mental health services and thus further negative experiences by some marginalised groups, they may perpetuate the stigma and fear that surround mental health problems and services. Stigma is two-directional. It must be recognised that mental health professionals are not immune to the internalisation of stigma and of other oppressive beliefs. Many people with mental health problems report experiencing stigma and discrimination within health and mental health services, so much so, that the largest anti-stigma campain dedicated part of its activities to tackling such stigma (please see ‘Education not discrimination’ of the ‘Time to Change’ campaign). I was involved in some of these projects as a consultant a few years ago and as part of this, facilitated a range of discussions and training. The latter brought home to me that many myths are still going strong within the mental health sector. For example, the posited submissiveness of South Asian women and their alleged oppression in their homes or the ‘resistance’ of Black men to experiencing depression and their presumed violence/aggressivity have been repeatedly raised as reasons for race inequalities within the mental health system and difficulties in engaging these groups. 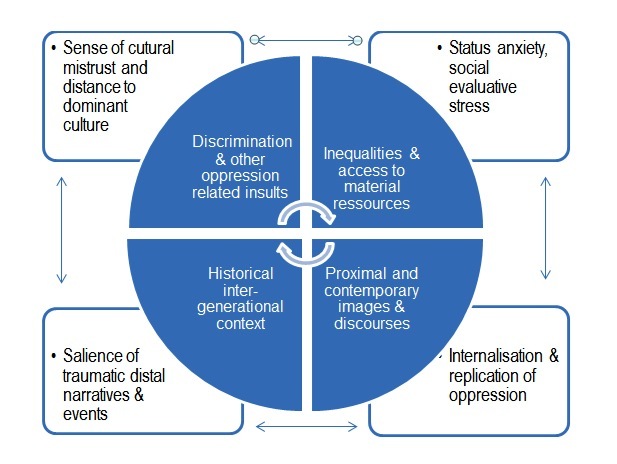 Those stigmatising beliefs together with the common denial and/or dismissal of experiences of racism (and the limited cultural competence of services) would naturally deter some BME groups from seeking help from us and from engaging with services; particularly when such contact may be frown upon within one’s environment or community, arguably for good reasons. Of course too, such dicoursive notions may become internalised and present either social and/or ego threats so that people may understandably consciously reason : ‘I am already facing so much discrimination as a minority in the world, I cannot afford to expose myself to mental health discrimination and stigma’ or ‘I will not give the dominant group the chance to subjugate me some more’. More unconsciously perhaps, some may come to feel : ‘I am inferior/worthless and do not want to evidence or to expose this’. It may be useful to consider potential social and intra-psychic dynamics when discussions around mental health stigma in ethnic minorities are had. Stigma is relational and functional too. At a very basic level, for people to experience or internalize stigma, there needs to be, at least to some degree, others who stigmatize and project. Taking collective responsibility for the on-going stigma and discrimination many face both personally and professionally may help ensure more attention is dedicated to reducing the devastating impact of mental health stigma and discrimination in the lives of people who are often already vulnerable, socially isolated and disempowered. And, that we do not perpetuate stigmatising or othering discourses unintentionally. Thank you for reading. If you have found this article useful, please share it with others. Brindle, D. (2013, April 30). Mental health anti-stigma campaign fails to shift health professionals’ attitudes. The Guardian. Retrieved from http://www.theguardian.com/healthcare-network/2013/apr/03/mental-health-anti-stigma-campaign. Clearing House for Postgraduate Courses in Clinical Psychology http://www.leeds.ac.uk/chpccp. (2013). Equal Opportunities Numbers. Keynejad, R., (2008). Barriers to seeking help: What stops ethnic minority groups in Redbridge accessing mental health services? London: North East London NHS Foundation Trust. Littlewood, R., Lipsedge, M. (1982). Aliens & alienists: Ethnic minorities and psychiatry. Routledge London. SCM (2002) Breaking the circles of fear: A review of the relationship between mental health services and African and Caribbean communities. London: The Sainsbury Centre for Mental Health. TTC(2008) Stigma Shout: Service user and carer experiences of stigma and discrimination. London: Time to Change. A few months ago, I met with a very good friend of mine: a community activist, race equality campaigner and artist. She and I go some way back. Our passion for equality and community work together with our shared experience of immigration (she’s white and of Latin American origins) meant we have built a strong bond over the years. I was invited to her art studio where I met a friend of hers for the first time, a white English man of a certain age who despite his humble social origins, had successfully established his own business. I felt his warmth and openness and, he and I clicked instantly. We quickly bantered and took turn critiquing the artwork on display by proposing outrageously random interpretations. The atmosphere was relaxed and friendly. The three of us eventually settled at a table for a glass of wine. I cannot remember what brought the subject on but the conversation turned to immigration. Before I knew it, I was listening to some of the most disturbing views I had seen expressed openly in a long while. The gentleman started by recounting an event at work within his previous role as bank manager when he had been accused of racism by an Asian client for whom he had declined a mortgage. He became somewhat agitated as he described what he thought was an attempt by the client at using the ‘race card’. He put to me that people of colour tended to use the race card when things did not go ‘their way’ and subsequently spoke about an incident during which he had got into a dispute with a Jewish man who he said had taken offense at the Christmas decorations inside the bank. Ironically, he lamented what he felt was intolerance on the part of the Jewish man particularly as he, an English man in his ‘own’ country, had to tolerate Jewish decorations on the streets of London. The talk ended with him discussing the threat of a foreign invasion through immigration, England’s unrecognizable face and the fight the country was required to lead in order to preserve its culture and identity. I was so troubled by this plainly prejudiced tabloid-like rant; which emerged with no prior warning; that my heart started to palpitate. Nevertheless, I felt the strong impulse to stop the conversation had to be resisted. As he went on (and on); I painfully managed to stay with the anxiety and outrage the tirade had triggered in me. I shifted my focus outward by attending to the emotions and feelings he was displaying which to some degree paralleled what I was experiencing. This slowed my heartbeat down. Helplessness and anger became apparent, but in the main, it was fear and anxiety which dominated. These feelings were palpable and appeared authentic to me. It struck me that it seemed they had been bottled up for some time and; for whatever reason; our very brief relationship had provided an outlet for them. Why he had felt the need for this cathartic release still evades me. One thing is for sure though, he was addressing me rather than my friend and I almost intuitively refrained from intervening, elucidating and/or challenging him. By not doing so, I bore witness to an experience that is often dismissed. When I shared with him some of my experiences of our conversation, he appeared genuinely taken aback. I noted glimpses of shame as he withdrew into a more socially acceptable and politically correct stance. He apologized profusely and more importantly, became reflective rather than defensive. He said he had not wanted to cause any offense to me; which incidentally I believed; and that he had felt it was ‘okay’ to discuss these things with me. I was surprised by the relatively high level of empathy and compassion I was able feel toward this man. Although I despised his attitude toward foreigners and immigration and could hardly tolerate his apparent bigotry physically or psychologically, I could not but be touched by his display of emotions regardless of how misguided and irrational he came across. This interaction provided me with an invaluable learning opportunity which I would probably have missed had I taken the moral or intellectual high ground. I have (typically) dissected this exchange in my head and theorized over it hundreds of times using different frames of reference. My aim here is not to offer a commentary on his overflowing raw (male and white) privilege, to condemn his views or to expose the fallacy of his points but rather to try and propose a theoretical interpretation. Many may see neuroticism and paranoia in the seemingly disproportionate concerns over identity/cultural losses and the reported fear of being overpowered by some alien enemy. Rationally of course such fears cannot be sustained. Some may argue that the media coverage and political attention immigration receives, would invariably create such unfounded anxieties. It would in my opinion, be difficult to generate such anxieties if something of a nucleus of a pre-existing fear was inexistent. There needs to be something to be tapped into, something onto which political and media agendas and rethoric may be hooked onto. Fears of invasion precede the invention of the mass media and have been widely documented across centuries and ‘western’ cultures. Undeniably then, such fears have existed for some time independently of media and political influences. Several theories may be advanced to frame such anxieties which may have multiple origins. Here, they will be considered in relation to our imperialist past. Indeed, when one considers processes of imperialism such as colonisation and slavery, fears related to loss of identity, invasion, and imposed enculturation lose their neurotic/paranoid aspects and instead seem to acquire a ‘déjà vu’ quality. Intergenerational trauma may thus offer an interesting framework to consider this resonance. Intergenerational trauma may be defined as the cumulative and collective transmission of historical oppression and of its negative consequences across generations. It is believed to manifest itself emotionally and psychologically in members of different cultural groups who have not directly been exposed to the traumatic stressor in question. Most of the studies on the phenomenon have concentrated on the offspring of survivors of the Holocaust. Nevertheless, the concept has been used to illuminate the experiences of various racialized and indigenous groups. Here naturally, I am not concerned with the intergenerational trauma of the oppressed but with that of the oppressor. The trauma the latter suffered as a result of active and passive participation in oppression is less documented and less theorized upon, all the same, there is evidence that terror existed on both sides of the power divide. In view of the abuse oppressed groups endured, rebellion and the possibility of “payback” are bound to have instilled great fears. Many oppressors were indeed hunted by the belief that they would suffer the very fate they had imposed upon oppressed groups, if overthrown. This belief terrorized the hearts of generations and of course led to unspeakably brutal repressions throughout history. As an example, when the collapse of the apartheid system became imminent, many Whites in South Africa violently fought for its maintenance fearing its end would lead to retaliatory genocide by Black South Africans on White populations. The extreme defensiveness and hostility many feel towards foreigners have been postulated to be manifestations of the guilt evoked by the crimes committed against indigenous and racialized groups. If intergenerational trauma as a conceptual tool can be useful to cast light upon the experiences of those who have historically been at the receiving end of oppression, may it also help make sense of the apparent paranoia and neuroticism evoked by immigration in those who have tended to fulfil the oppressor role? I am not aware that the concept has previously been considered for this purpose. Nonetheless, the hypothesized residual trauma could help account for the appeal of political parties which play on such angst. There is really nothing new about the rise in popularity of Nigel Farage. There have been plenty of Farages throughout history particularly during times of economic crises. The knee jerk muting of the experiences of those we have come to characterize as bigots, with the whip of political correctness, seems unprecedented. However well intentioned, such silencing may lead to feelings of victimisation and alienation and thus result in the entrenchment of prejudice in addition to distracting from more silent forms of racism. If we can truly engage with all experiences then perhaps meaningful dialogues on race, racism and immigration can start to take place both politically and therapeutically (I have previously written on some of the difficulties of creating such exchanges, here). Learning to attend to the suffering of the ‘oppressor’ may consequently provide tools to combat bigotry and prejudice. Connolly, A. (2011). Healing the wounds of our fathers: intergenerational trauma, memory, symbolization and narrative. The Society of Analytical Psychology, 56, 607-226. Portney, C. (2003). Intergenerational trauma for the clinician. Retrieved from http://www.psychiatrictimes.com/articles/intergenerational-transmission-trauma-introduction-clinician.